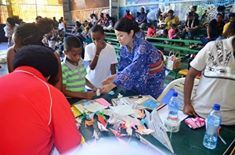 The Japan Day Celebration Festival was held today at the Don Bosco Technical Institute Taurama Campus in Port Moresby, which was hosted by the Japanese Embassy along with Japanese business houses and the small Japanese community living and working in Port Moresby. Ambassador of Japan to PNG His Excellency Morio Matsumoto said “The initiative behind the Japan day festival is to showcase Japanese culture and traditions and also to strengthen relationships between Japan and PNG, the general public are invited to learn and be educated in some of Japans proud traditions where workshops will be held like the art of Ikebana which is the art of floral arrangements and Origami the art of folding paper and a special Koto performance by the Japanese Embassy”. The Japan Day Festival marks the second of its kind in Port Moresby and also present was Japanese companies such as Ela Motors who sold fresh vegetables with proceeds to be given to charities in Port Moresby and Daikoku restaurant which featured some unique Japanese cuisine in Takoyaki which is a ball-shaped Japanese snack made of a wheat flour-based batter and cooked in a special takoyaki pan which was filled with octopus.